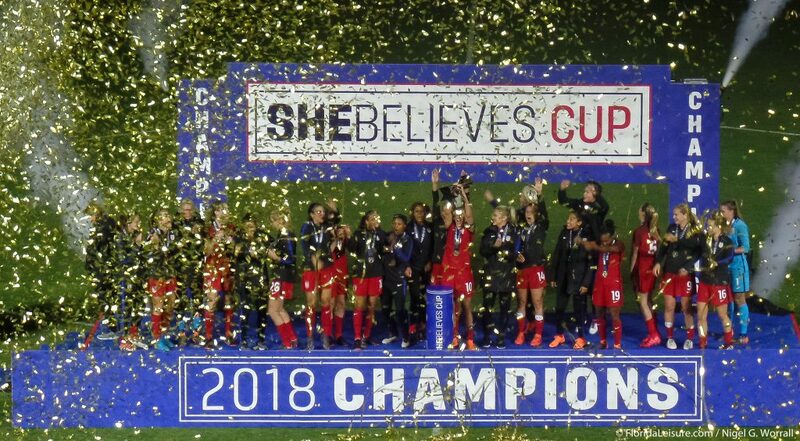 The U.S. women’s national team beat England by a solitary goal on Wednesday night to win the SheBelieves Cup tournament at Orlando City Soccer Stadium. The top-ranked U.S. team beat third-ranked England after an own goal after a mix up between defender Millie Bright and keeper Karen Bardsley. Megan Rapinoe’s 60th minute cross didn’t seem to be causing much danger until Bright and Bardsley ended up fumbling the ball and the English keeper watched desperately as the ball cannoned off her leg and into the net. It was a close game and the Lionesses were hoping to pick up one point from the match in Orlando in order to claim the title in Phil Neville’s third match in charge of the England team. Late in the game, England thought they had scored an equalizer but Ellen White’s header bounced off the inside of the post and was cleared from danger. It meant the USA finished top of the table while England were second, ahead of the defending champions France on goal difference who beat Germany 3-0 earlier in the day. Before the match at Orlando City Stadium, there had been a moving moment of silence for the 17 victims of the Marjory Stoneman Douglas High School shooting. The team invited the family of victim Alyssa Alhadeff, as well as her club and school teams. The guests all received special jerseys with Alhadeff’s name and number on them.